According to the World Association of Wind Power, Mexico grew its wind power sector faster than any other country during 2009, and now has more than 500MW of installed windpower capacity. ﻿Mexico’s goal is to have an installed capacity of 2,500 MW of wind energy by 2012, and to have 26% of the nation’s installed capacity coming from clean energy sources (solar, geothermal, wind, nuclear and large-scale HEP). The Federal Electricity Commission, responsible for the national power grid, is installing two “wind corridors” in Oaxaca to connect several different windpower plants into the grid. Mexico’s Energy Secretariat recently announced the publication of a new resource of interest to planners and geographers. The Atlas of Wind and Solar power potential is designed to inform investors of the necessary meteorological and climatic background prior to taking significant investment decisions. According to the Atlas, Mexico’s wind potential is estimated at 71,000 MW. This figure comfortably exceeds the nation’s current installed capacity for all forms of power of 51,000 MW. The most important single wind-power region in Mexico, and also one of the most important at the global scale is the Isthmus of Tehuantepec, the narrow belt of relatively low-lying land that links the Gulf coast (straddling the Veracruz-Tabasco state boundary) to the Pacific coast in the state of Oaxaca. Several major wind farms have already been developed in the La Venta section of the Isthmus. Others are being constructed or on the drawing board. For example, Grupo Bimbo (which, with the acquisition of Sara Lee, has become the world’s largest bread- and pastry-maker) announced it is building a wind farm in association with Desarrollos Eólicos Mexicanos (Demex), a subsidiary of Spanish renewable energy firm Renovalia Energy. The “Piedra Larga” wind farm is under construction in Unión Hidalgo, Oaxaca. Costing $200 million, it will have an installed capacity of 90 MW when the first phase is complete, rising to 227 MW when the project is complete. This is sufficient energy to power all Bimbo’s producing and distribution needs in Mexico during the next 18 years at least. The first power will be generated early next year. 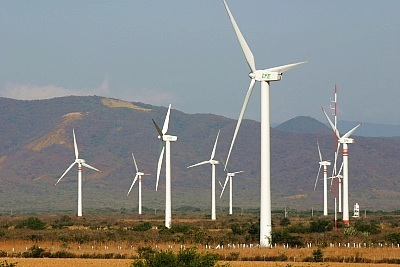 Two mining companies are also installing wind farms in Oaxaca, each with an installed capacity of 300MW. Elsewhere, in Baja California, ﻿California-based Cannon Power Group plans is constructing a 1,000MW wind farm in Baja California. The 500 turbines of the 1-billion-dollar Aubanel Wind Project will be located southeast of the town of La Rumorosa, in the mountains between Tijuana and Mexicali. The turbines will supply power to both the USA and Mexico and are a separate project to the 1000MW wind farm planned by Energía Sierra Juárez, a subsidiary of Sempra, for an area north of La Rumorosa. Currently, Mexico is developing wind power much more quickly than solar power, but this may change in the future, given that much of the country receives between 5 and 6kw/hr/square meter/day in solar energy, which is considerably more than most of the European countries which are now undertaking solar power development. Energy is analyzed in chapter 16 of Geo-Mexico: the geography and dynamics of modern Mexico. and concepts of sustainability are explored in chapters 19 and 30. Buy your copy today, so you have this handy reference guide to all aspects of Mexico’s geography available whenever you need it.